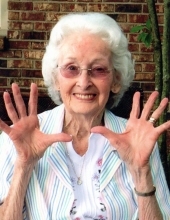 Stella Louise Tapp Brumback, age 95, widow of Charles Brumback, passed away Friday, March 15, 2019, peacefully at her home. She was born July 8, 1923 in Georgetown, Kentucky to the late Maylon and Estelle O'Banion Tapp. Stella was a graduate of Garth High School, was retired from Blue Ribbon Pen & Pencil, Mallard Pencil, and had been a volunteer with the Georgetown Hospital Auxiliary. Stella still had her sharp mind. She loved to travel, when she was able, she loved coin slots at Belterra Casino and she was an avid U.K. Basketball fan. Most of all she loved her Grand and Great Grandchildren. Stella is survived by her three children, Stephen (Beverly) Bowman of Lexington, Kentucky, Debra (James) Yocum of Carrollton, Kentucky, Mark (Amy Duncan) Roberts of Georgetown, Kentucky, five grandchildren, Lori (Kevin) Back, Leslie (Scott) Gibson, Jessica (Greg) Vititoe, Chase (Angie Moore) Howard and Josh (Heather) Yocum, and nine great grandchildren, Christopher Back, Emily Back, Ethan Gibson, Kaitlyn Gibson, Eli McArter, Julie Howard, Damien Howard, Ava Yocum and B. Powers. She is also survived by her sister, Margaret Butts of Carrollton, Kentucky. Visitation for her family and friends will be Wednesday, March 20, 2019 from 12:00 to 2:00 pm at Tucker, Yocum & Wilson Funeral Home with service to follow at 2:00 pm. Burial will follow the service at Georgetown Cemetery. Pallbearers will be Chase Howard, Andy Howard, Tom Pribble, Kevin Back, Josh Yocum, Christopher Back and honorary bearers will be Ethan Gibson and Eli McArter. To send flowers or a remembrance gift to the family of Stella Louise Tapp Brumback, please visit our Tribute Store. "Email Address" would like to share the life celebration of Stella Louise Tapp Brumback. Click on the "link" to go to share a favorite memory or leave a condolence message for the family.